admin July 17, 2018 July 17, 2018 No Comments on How To Check And Update Device Drivers? Every device on your computer has a driver to make it run properly. Each one is vitally important to keep your computer running like it should. However, things go wrong and can get damaged, meaning you need a device driver update to fix the problem. These are all signs that something is either out of date or has been corrupted. You will need to update your drivers to get the device working again. Discover Your Current Driver Version – Click Start, then right click My Computer and select Properties. Then select the Device Manager tab. click the (+) sign (Windows Vista) or the arrow (Windows 7). When you do, make note of the most current one. Find New Drivers – Next, you will need to go to the manufacturer web site. You can tell if a driver is newer by checking the date created. The most recent date is the latest version. Download New Drivers – Once you find what you are looking for, follow the onscreen instructions to download the latest driver. Install New Drivers – Navigate to where you downloaded the driver. Then double-click the icon. Installation instructions should appear on your computer. Most of the time the directions will be names readme.txt or readme.doc. Remove Old Drivers – Once you have established the new driver works, remove the old ones from your computer. To do this, go back to the Device Manager. Find the old driver and right click it. Select Remove to uninstall. Most people prefer to skip all the above and have software update for them. Since driver update software is completely automated, it can scan your computer for drivers in need of an update in a matter of minutes. It takes all the guess work out of looking for and finding new drivers for your computers devices. Start Scan – Click the “Scan” button and automatic driver update software will scan your computer for outdated device drivers. Start Downloading New Drivers – Click the “Download” or the “Download All” button to begin downloading the latest drivers. Most people will choose Download All as an easy way to update all the drivers at once. However, if you are having lots of problems, you may wish to download and install the drivers one at a time to isolate problems. Install the New Drivers – Click “Install” to start installing the downloaded driver. Whether you installed manually or automatically, the last step after a device driver update is to restart your computer. A system restart will force every window and program closed. It will also allow any needed Windows updates to finish installing. Driver Armor is software to autopilot your PC drivers. 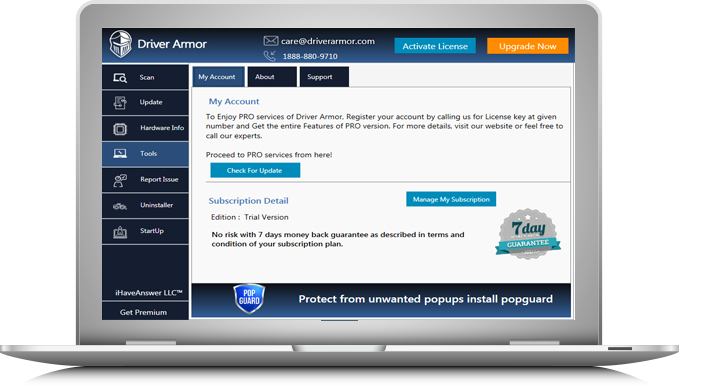 And Driver Armor’s simple and friendly interface will show you exactly what you need to do to find any device driver update [http://www.driverarmor.com] in less than two minutes with just a few clicks of the mouse button. The Feature To Look In Online Driver Update Software!